KingRoot is an Android application, which is primarily built for the purpose of rooting your smartphone. This powerful rooting application is built by KingRoot studio and it is available for free. If you are looking to download KingRoot application so that you can root your Android smartphone or tablet, you are on the right page. Here, we have provided all the versions of KingRoot application which has been released till now. The KingRoot application lets you root your Android smartphone or tablet pretty quickly. 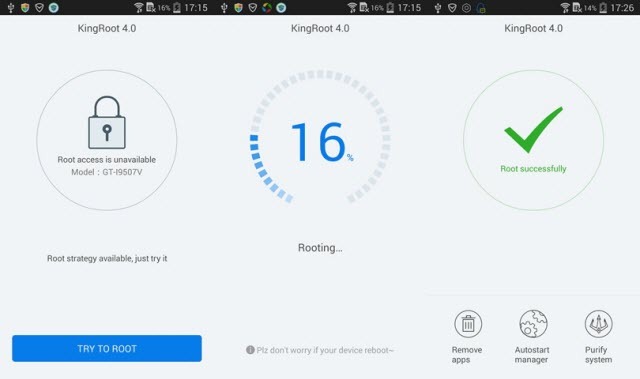 To root your device, all you have to do is download the KingRoot.apk from here, install it on your smartphone, open up the app and then click on the Root Button. Once you finish doing this simple process, your device will be rooted successfully. The KingRoot application is a free Android app, and you can download and use it without paying a cent. Also, the KingRoot is available as a mobile app which takes out the need for using a computer to root your Android device. Just download the .apk file, install it in your device and root it successfully. The KingRoot application doesn’t require an active internet connection to root your smartphone. Once you have downloaded the application to your smartphone or tablet using an internet connection, you can root your Android device without getting back online. This is one of the major advantages of KingRoot application over other one-click rooting apps. When you use the KingRoot application to root your smartphone or tablet, you don’t need to worry about data loss because the app will root your device without data-loss. All the personal data in your Android smartphone like pictures, videos, contacts, music, etc., will not get affected by using the KingRoot application to your device. In this tutorial, I will teach you how to install KingRoot APK on your Android smartphone or tablet. Step 1: To get started, download KingRoot APK (latest version) from the link given above. 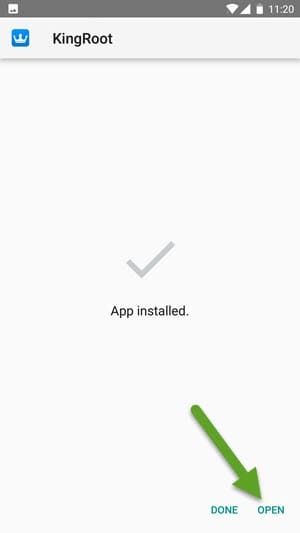 Step 2: Once done, click on the downloaded (com.kingroot.kinguser.apk) file and select “Install” to launch the installation process. 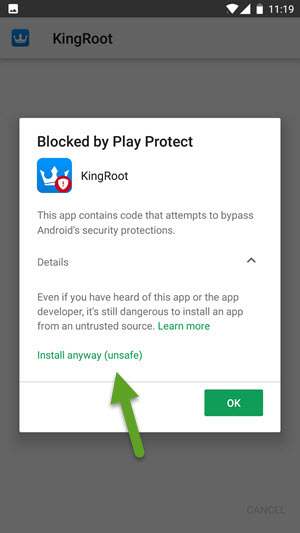 Step 3: While doing so, you will get a “Blocked by Play Protect” prompt saying “This app contains code that attempts to bypass Android’s security protections“. Step 4: Now click on “Details” in the prompt message and select “Install anyway” to continue with the installation process. Step 5: Once the app has been installed, you will get the “App Installed” message. Step 6: Now click on “Open” to launch the KingRoot app on your Android device. That’s it. 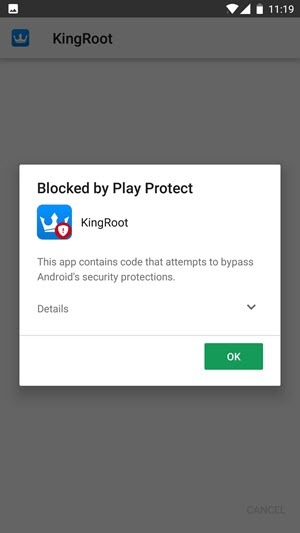 Now you have successfully installed KingRoot APK on your Android device, and you can use it to gain root access on your smartphone or tablet. If you encounter any issues while following this tutorial, do let me know via comments. 1) Using KingRoot application to root your smartphone is quite an easy task. Just install the application on your Android device, open it, click on the root button to root your device. If you are still not sure how to do it, follow our guide to root any Android device using Kingroot App. 2) Although KingRoot will let you easily gain root permissions in your device, it will also void your Android device warranty. Unless you unroot your Android device, you won’t be able to claim warranty. 3) Please drop a comment below if you have used this app but still couldn’t root your Android smartphone or tablet. We will provide alternative solutions to root your device. 4) If you would like to unroot your Android smartphone by uninstalling Kinguser application, check out our guide to remove kinguser and unroot Android device. 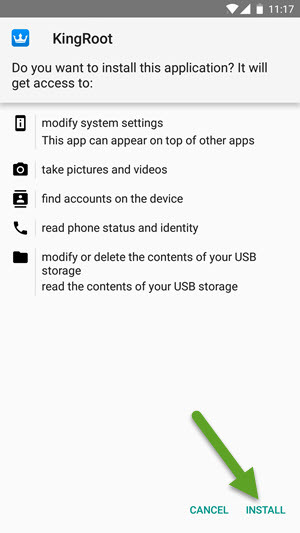 5) If you would like to replace the Kinguser app installed by KingRoot for managing root permissions on your Android device with SuperSU app, follow our guide to replace Kinguser with SuperSU. 6) If this app doesn’t root your device, try these alternative one-click root Android applications: 360 Root, Framaroot, Towelroot, iRoot, Root Genius For Mobile. I root my N9132 Prestige Touch boost mobile phone. Can I get help. I have a Samsung Galaxy j700p and I try to root it and it wll not work, what should I do. My samsung galaxy j5 and king root no root help my. so what can i do for root? Sure, I will provide a working rooting tutorial for your device shortly. Ja tentei vaaaarias vezes e nao carrega! Nunca consigo! O meu aparelho é o moto E2, nunca chega aos 60% de carregamento do Root, mas tentei o KingoRoot e apareceu que rooteou, porém os apps não abriram, ainda deram a mensagem que precisa de Root. Hi, I am sorry. I have no clue what you are explaining here. Please explain in English. We will provide a working rooting tutorial for your device shortly. I got this phone too and this Kingroot is the only one that roots but after reboot of phone it is gone, and I even contacted Kingroot about it and they don’t even bother to respond at all. We are just out of luck. Sir can you help me to root my divice .. i already use any kinds & methods of rooting tools but still not rooted .. it always says “stategy unavailable” .. plss sir help me fix it .. i’ll wait for your reply .. thank you ..
Not working this apk for samsung j200h plz help me? Nabin I have the same problems except I have a moto g. Help us! Right now we don’t have a root solution for your device. Once we find a working solution, we will update it as a post here. So, don’t forget to subscribe for our updates. That’s right. But not all people with smartphones will have that privilege! My Samsung Galaxy SM-E700H don’t accept rooting; I have recently upgraded it to 5.1.1 Android version, is it the reason for that?Please help me to find the way for rooting. Last version of Kingroot (November 23) does not work on my J7 2016 MM 6.0.1 ? I have trying to root my samsung sm-j110g with all kind of kingroot version from v 4.5.0 until v 5.0.0 but dosn’t woork. Can you help me ?? Tired to try with no solution from kingroot. Will this method also work for rooting android boxes? I’m trying to root my mxq pro 4k rk3229 chipset. Any help would be appreciated. vivo y51 v5.0.2 on don’t get root access by kingroot apk v5.0.1 any any version . please help me i warn my brain. can i root samsung glaxy j5 (SM-J500F) android 5.1.1 with kingroot 5.0.1 ? Yes, You can root samsung galaxy j5 using kingroot. Gan buat samsung j5 marshmallow bisa ? Is the rooting system depending on the internet? Yes, You can root samsung galaxy grand prime 4G using kingroot. I have a Kyocera Hydro Air c-6745, and KingRoot won’t work. Any help? Help I have a Samsung Galaxy s5 SM-G900F android 6.01 and I try to root it and it wll not worki what should I do. How to root Samsung Galaxy J2 (2015) ? Sir? Same problem but i will wait, hopefully i can enjoy it very soon too. Can you email me when you have it? LG STYLUS2 K520 no root kingroot no. hello sir i have a ilife tell k3400IQ model but i cant root it why? Help. I can’t root my lava x17 using kingroot. Any suggestions. What version of kingroot has been tested on the Samsung Galaxy Express Prime SM-J320A… Android version 6.0.1…At&t version and is a working method and/or do you have any suggestions to root this device? hi I have sm-j200h 2015 and I cannot root it using kingroot.What should I do??? Failed to Root AGAIN 69%? sir my phone is symphony p6.like lollipop version. king root can’t root this device. sir how to root my device with king root.plz plz plz tell me…..
2) Next, Go to Setting–>Apps–>Kingroot and click “Clear Data” Tab. Can i root my Samsung Galaxy on7,Android6.0.1?? My problem is, when i start kingroot it shows that my device is not adaptable yet. Android version6. 0.1 device coolpad note 5. If I have a usable desktop or laptop I honestly wouldn’t be wasting my time here. How about Lenovo a7000 turbo + sir? What does it mean when i have to root request? Does it mean i cant root it on my device? I will share the rooting tutorial shortly. Vivo y55l won’t root it reaches 62% and fails plz help I also have PC should I try with that?? Can I know that is 100% it will have success with PC?? Hello,sir.My mobile is Walton primo n2.I want to root my mobile.please help me to root my mobile. I totally agree with your blog, your blog is so nice and beneficial. A catchy headline interests the readers to read the content in brief. I have tried the king root app several times still not having any luck. Is their a newer update coming out to allow me to root my Samsung Galaxy On5 (SM-G550T ) And (SM-G550T1), without a pc, i dont have access to one. Thanks for your time. Says it cant root with so many words, also tells me to request with 846 others. I do the request and even left my phone on that screen for over an hour. I appreciate the help and sorry to bother, cant wait for the next update of ur app so i can get rid of all this bloatware. Thanks for ur time and reading this. Why did I this happened??? My device is samsung j7 …i tried somany times but the king root not adapting…what can i do ?? ?…please replay…. I have onda v891w ch tablet, it says not adaptable yet. Any recommendations? sir my phone is symphony p65.0.like lollipop version. king root can’t root this device. sir how to root my device with king root.plz plz plz tell me….. I have VIVO Y31L. I am not able to root. Getting “Not Adaptable Yet” message. Help me guys. 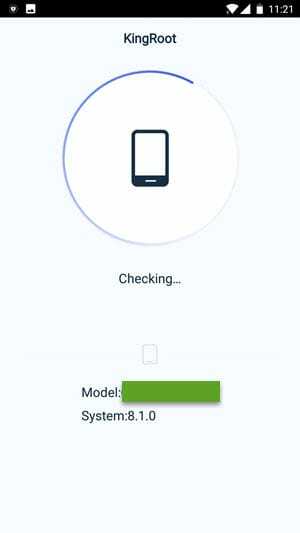 samsung j7 (2015) how to root this ? swipe elite sense marshmallow 6.0.1 …… How to root this device??? Root for Samsung galaxy express 3??? I own a Sky Elite 5.0L (chip MT6735p) with Android 5.1.1, and I can’t find any suitable way to root it. This phone is very nice, but lacks internal space. I bought Link2SD, which works great when your phone is rooted. Mine isn’t, and I am not able to root it. I have tried both APK and PC version of KingRoot (v5.2.0). plz help me to root my device! sir how can I root my vivo Y55s phone. Is this compatible with Vivo Y53? I want to root my device. Please help me. Thank you! I follow this way perfectly but the way failed. another way please, thans bro very much. hi, also the result was roote failed again. another way if you can help me, i search a lot but i didn’t find success way. there is way with Odin but i didn’t find file md5 for Lenovo tab2 x30l that inser in AP square. Odin is only for Samsung smartphone devices, It’s not suitable for any other devices. I Have Samsung galaxy on7 pro and i cant root my device, it says not adaptable yet. I have a Samsung Galaxy J3 6 phone and my grandson put a password on my phone and I need to get the password lock off the phone. Can you help? Hi, i want to root my phone Huawei ALE-L21 with kingroot but i’m in the wish list since one week now. How long does it take until i can root my phone? It is working properly for us. I tried to root phone several times. Please help with a link for Samsung J320W. Can’t root my Samsung J320W. which version of king root is suitable for karbonn aura 9 ? Please help i requested to make my J7 have root but wont work. Please help me root HTC m9. J7 Prime. I installed king root but I never received the option to root my phone. It went straight to a screen where I said I could optimize system. Does this mean i should try a different app? I tried to root leagoo m6..
MY Phone SAMSUNG SM -T113, dot not have my mobile phone root, how i can Root. Wtf aIts working bro..SuperB thanks! Hey men please help me i really really need to root my phone and it’s impossible to do it, i tried all rooting apps and i tried also the installing of supersu zip file on my phone but non of them do it succesfully all failed even in pc i can’t root it with pc it says verfication signature failed whole file, please reply me realquick please i really need to root my device thankyou. please do a tutorial on how to root a cloudfone nba edition –ive tried all apps and there werent any success..
is rooting vivo v5 possible? how can I root sm 9000h . my Samsung Galaxy s5 , I have try to install king root but it didn’t show root? help me. Cannot root my infinix hot note x-551. Granted in accessibility and device administrator still it fails after rebooting. Cleared the data, uninstalled and installed again and tried rooting for the second time but still the problem prevails. How to root my android device… all rooting System fail without pc or with pc… anyone please help me..
Hi, Im trying your tutorial but it says root failed : Root Success rate can be increased by more than 20%. Please reboot or release the memory and root again… Im doing it and it still not work. Do you have a tips for me please? Will this work for Samsung Galaxy J1 Mini (SM-J105Y)? Tried it on Sony Xperia Z5 Compact E5823 and it foes not work even though it is in the supported devices list. I have oppo a37f and i can’t root my phone. not working my device Blaupunkt Soundphone S2. 3) Now Reboot Your Phone. is there any other tools to root my phone? Galaxy J2 Prime. I cleared data, optimized, it says two issues need attention: System security and Advanced permissions. System security looks OK, but on the advanced permissions page there is a big R with a slash through it and under it “No Root permission, feature unavailable.” If I tap anything below it, nothing happens. Looks like it doesn’t work on my phone. You skipped a step. The download gives me an installer. I tried to install, I thought I gave it all the necessary permissions, and it said “X App not installed.” On retry I don’t get any opportunity to change permissions. I touch the installer, touch “INSTALL,” touch “INSTALL” on the next screen, it says “Installing,” and then I get “X App not installed.” I already uninstalled the old version so I don’t have a Kingroot app to do the next step. OK, I found the solution: go to Play Store, menu, Play Protect, disable scanning. Now I open KIngroot, I get a screen with a big 97 in a circle, “1 issue need attention,” “Optimize,” “System security,” “Advanced permissions,” “More tools.” There isn’t any root button. What do I do now? Appreciate your effort first,followed your step and installed it on my Redmi note 4, after opening the app i got a message saying not adapted yet( i think it may be due to the latest update of MI UI few days before)is that right,i saw already 21 requests filed in to adopt.Hope you support us soon, thank you. Could you possibly help me root my galaxy s7 edge ATT model with this method or another method without the use of a pc any help would be greatly appreciated.